Win a 2017 Chevrolet Equinox! Only 300 Tickets available! A one in three hundred chance of winning for only $100 per ticket. Your chances of winning will never get better. And best of all, lottery proceeds will purchase medical equipment for the Ajax Pickering Hospital. 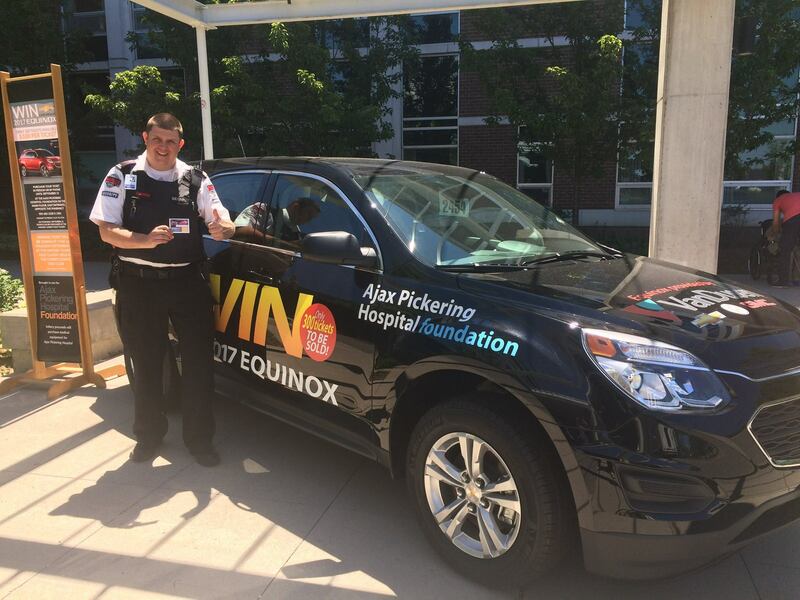 VanDusen Chevrolet Buick GMC is a proud sponsor and provider of a 2017 Chevrolet Equinox for the Ajax Pickering Hospital Foundation Lottery. We are proud to be part of a great community cause that benefits all of Ajax, Pickering and Durham Region. Tickets are selling fast for this car lottery!! Now there’s *less than 25* tickets left! Don’t wait to buy yours today, for your chance to win a 2017 Equinox! You can purchase your ticket in person until September 13 at the Ajax Pickering Hospital Foundation on the Main floor, East entrance, opposite the Pharmacy. Or call 905-683-2320 x1501 – Monday to Friday, 9am-3pm. Payments accepted by debit, credit card or cash. 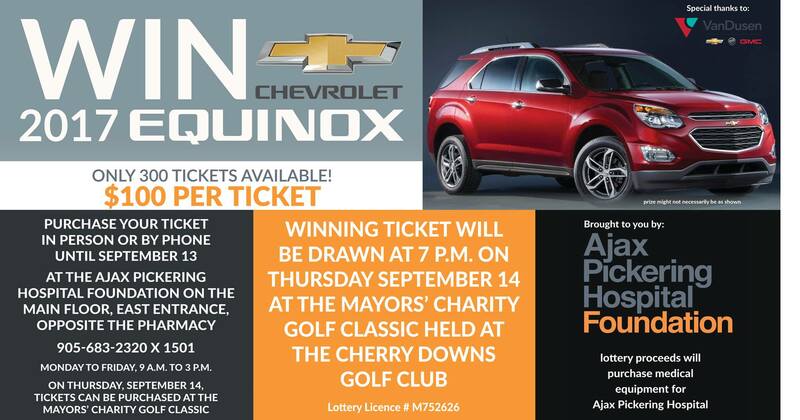 On Thursday, September 14, the winning ticket will be drawn at the Mayors’ Charity Golf Classic held at the Cherry Downs Golf Club located at 2110 Concession Rd 7 in Pickering. Tickets can also be purchased on the day of the draw at the Mayors’ Charity Golf Classic. The Ajax Pickering Hospital Foundation raises funds to support the purchase of leading edge medical equipment for the Ajax Pickering Hospital, as well as for major capital expansion projects. With the help of generous donors in our community, the Foundation has contributed more than $20 million to the hospital in the past 20 years, part of their vision of enhancing health care in our community. Since 1996, the premier golf event in Durham Region, the Mayors’ Charity Classic Golf Tournament, has raised money to purchase essential medical equipment for the Ajax Pickering Hospital. Together, they have funded everything from an emergency department cardiac management system, code blue carts, green light laser for urology, and infant care centres for newborns and much more. We are proud of what we have accomplished as a community. We have provided life-saving equipment and services that has helped hundreds of thousands of people in our community over the past 21 years.